If Prune can be rebranded a Dried Plum, why can't Yuca (pronounced yuck-ah) rebrand himself as Yuma (pronounced yum-ah)? He might look less than appealing on the outside, but at least he's trying to make a name for himself. 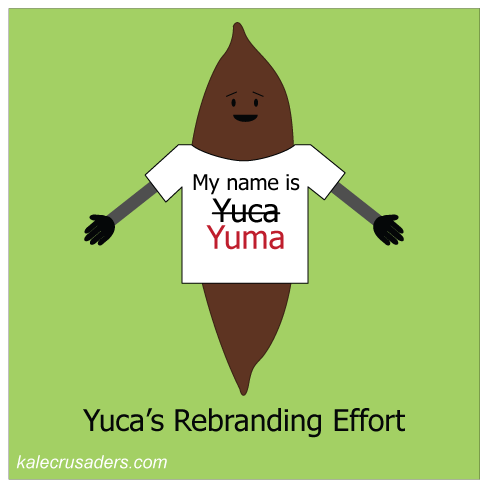 Whatever pet name you choose for Yuca, he's always delicious in baked yuca fries, yuca con mojo, mashed yuca with cilantro and lime, and tapioca pudding. Yum! Vote for Your Favorite Costume / T-shirt!